GARRETT, Finis James, a Representative from Tennessee; born near Ore Springs, Weakley County, Tenn., August 26, 1875; attended the common schools and Clinton (Ky.) College; graduated from Bethel College, McKenzie, Tenn., 1897; newspaper editor; teacher; lawyer, private practice; appointed master in chancery September 14, 1900-January 24, 1905; delegate to the Democratic National Convention in 1924; elected as a Democrat to the Fifty-ninth and to the eleven succeeding Congresses (March 4, 1905-March 3, 1929); chairman, Committee on Insular Affairs (Sixty-fifth Congress); minority leader (Sixty-eighth through Seventieth Congresses); was not a candidate for renomination to the Seventy-first Congress in 1928, but was an unsuccessful candidate for the Democratic nomination for United States Senator; appointed judge of the United States Court of Customs and Patent Appeals, 1929-1937; presiding judge of the United States Court of Customs and Patent Appeals, 1937-1955; died on May 25, 1956, in Washington, D.C.; interment in Sunset Cemetery, Dresden, Tenn.
Papers: ca. 1905-1916, approximately 3,000 items. The papers of Finis J. Garrett primarily contain correspondence. Also included are some accounts, invitations, printed materials, clippings, and an 1866 deposition of Alpheus S. White relating to stolen cotton. The correspondence primarily pertains to Garrett's congressional duties and to politics. Prominent correspondents include Edward Ward Carmack, Caruthers Ewing, James B. Frazier, Samuel Gompers, John W. Morton, Malcolm Rice Patterson, and Edward B. Stahlman. An unpublished finding aid is available in the repository. Garrett, Finis James. How Andrew Jackson Applied Democratic Principles; An Address ... January seventeenth, nineteen twenty-seven. N.p., 1927. ------. Proposed Amendment to Article Five of the Constitution of the United States. Speech of Hon. 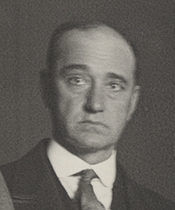 Finis J. Garrett, of Tennessee, in the House of Representatives, Tuesday, January 20, 1925. [Washington: Government Printing Office, 1925].